THE Steakhouse at Circus Circus offers Midwestern steaks aged for a minimum of 21-days in addition to prime seafood. Located on the casino level, THE Steakhouse is open for dinner nightly with early dining specials from 4:00 p.m. to 6:00 p.m. The wine list consists of a range of options for every budget and there is a full bar able to accommodate almost any drink request. 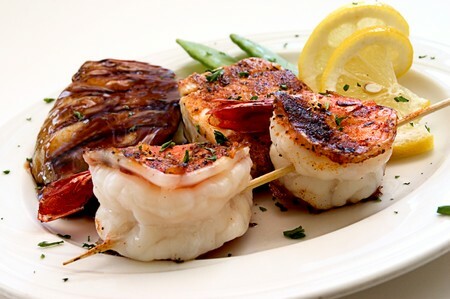 The straightforward menu includes appetizers like Oysters on the Half Shell along with several different salad varieties, and entrees like the Filet Mignon, Porterhouse or Lobster Tail. With red leather booths and rich wood accents, THE Steakhouse brings vintage Vegas appeal to the North end of the Strip. Main Dining Room | Dinner 5 p.m. - 11 p.m. This is one of those places that I almost missed. If one of my local friends hadn't turned me on to this location I would have never known about it. Amazing service and impecable food. Some of the best I have found in years of dining in and around Las Vegas. Don't miss this location. I generally avoid Circus Circus do to the crowds and small children every where but it is worth braving all of it to get to this wonderful dining experience!